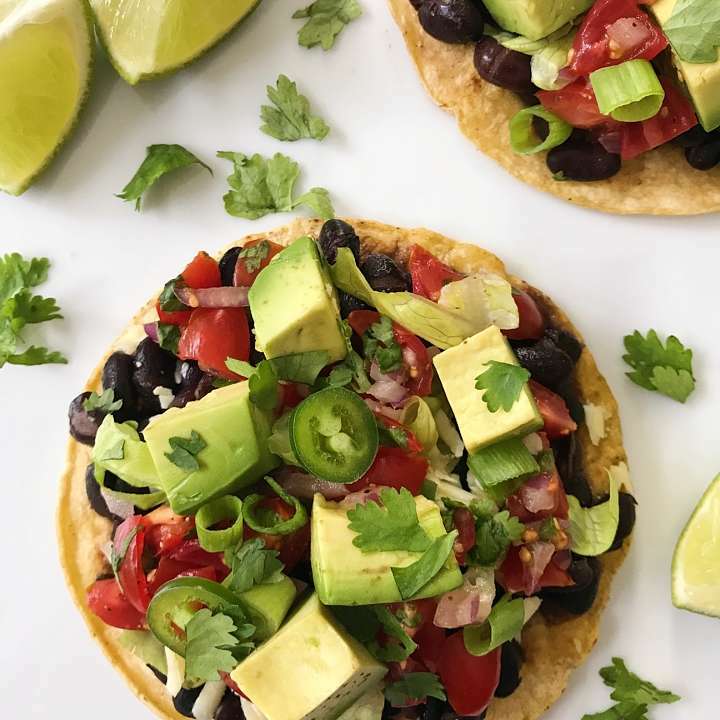 Piled high with allll the toppings, these tostadas are a quick, easy and crowd pleasing dinner! Celebrating Taco Tuesday with Tostadas! Or should I say a make your own Tostada bar because the beauty of this dinner is that it can be completed prepped ahead or last minute and everyone gets assemble their own tostada they way they like it! All you need is gluten-free corn tortillas, quick simmered black beans, the BEST tasting Tomato Salsa, shredded lettuce, Monterey Jack cheese, avocado, green onions, jalapeños, cilantro, sour cream and if you are like my boys, you could add some grilled chicken cut into pieces. This is my plate and it was beyond delicious! Packed with nutrients, flavorful and so satisfying! A quick, easy and crowd pleasing meal, these black bean tostadas are piled high with toppings and so delicious! The building blocks are Quick Simmered Black Beans, the BEST Tomato Salsa and gluten-free corn tortillas. After that add all the toppings you like! When ready to serve, toast corn tortillas: Heat a just a touch of olive or avocado oil in a small saute pan over medium heat. Add corn tortilla, swirl in oil and flip so that both sides have a bit of oil, sprinkle with salt and cook each side about 1 minute or two until starting to get golden brown in spots. On each plate, place a tostada, top with black beans, salsa, lettuce, cheese, avocado, green onions, jalapeño and cilantro to taste. Enjoy!